Few days ago, I published the official list of Infinix smartphones that will receive the Oreo update as well as the scheduled date. 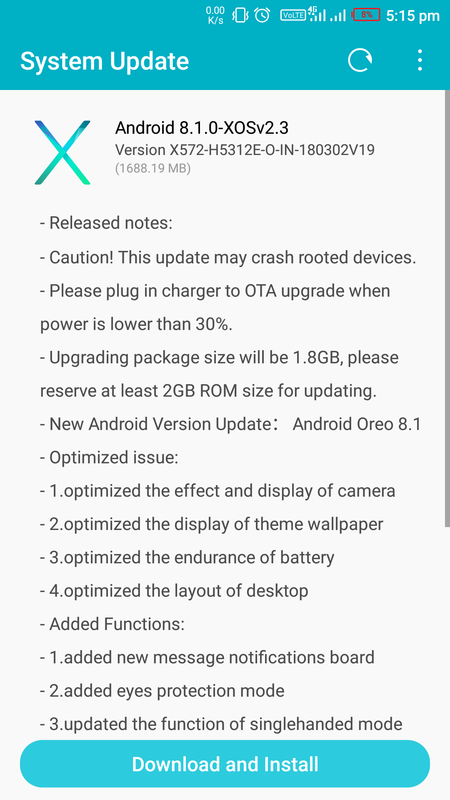 Infinix however decided to rollout the Oreo update for Note 4 X572 earlier than the scheduled date which was supposed to be next month. Infinix has the tradition of releasing one major update for all its devices ranging from the entry level to the high end devices and the Note is no exception. So if you happen to be a Note 4 X572 user then you should have gotten the notification already. Incase you haven't, just open the "System Update" app and click on the refresh icon at the top right corner. * Optimized the effect and display of camera. * Optimized the display of theme wallpaper. * Optimized the endurance of battery. * Optimized the layout of desktop. * Added new message notification board. * Added eyes protection mode. * Updated the function of singlehanded mode. >> Free up at least 2.0GB free space before you proceed with the update. >> Make sure you have up to 30 percent battery. >> Your phone should be connected to a strong WiFi or mobile network. >> Do not install the OTA update if you phone is rooted (even after unrooting) as that might brick your phone.